Louisville, KY – November 13, 2018 – Charah Solutions, Inc. (NYSE: CHRA), a leading provider of mission-critical environmental and maintenance services to the power generation industry, today announced financial results for its third quarter ended September 30, 2018. The net loss of $17.4 million, or $0.60 per diluted share, was primarily driven by a non-recurring $12.5 million loss on extinguishment of debt associated with its recent term loan refinancing, of which $10.4 million was non-cash, and a $20 million reserve, prior to any insurance recoveries, for outstanding legal claims. Adjusted net income and Adjusted earnings per diluted share1 were $7.6 million and $0.25, respectively. Adjusted EBITDA1 was $32.6 million for the third quarter, a 57% increase from the year-ago period. For the three months ended September 30, 2018, revenue was $186.0 million, an increase of $67.1 million, or 56%, compared to the year-ago period. Gross profit increased $3.6 million, or 15%, to $26.7 million from $23.2 million in the third quarter of 2017. Gross profit as a percentage of revenue, or gross margin, declined to 14.4% from 19.5% a year ago primarily due to lower gross margin in the Company’s Environmental Solutions segment. Environmental Solutions Segment: Environmental Solutions generated revenue of $103.8 million, an increase of $37.9 million, or 58%, from the year-ago period. The increase was primarily attributable to the acquisition of SCB in March 2018 as well as certain remediation and compliance projects, including accelerated revenues from an expected early contract completion in North Carolina. Gross profit increased $1.2 million, or 6%, to $19.9 million from $18.7 million in the third quarter a year ago. Gross profit declined as a percentage of revenue to 19.1% from 28.3% in the year-ago period primarily due to a change in the mix of projects, weather-related impacts and the acquisition of SCB. Maintenance & Technical Services Segment: Maintenance & Technical Services generated revenue of $82.2 million, an increase of $29.2 million, or 55%, from the same quarter a year ago. The increase was primarily attributable to the addition of nuclear services offerings, which did not have a full quarter of operations in the year-ago period. Gross profit increased $2.4 million, or 53%, to $6.9 million from $4.5 million in the third quarter of 2017. Gross profit as a percentage of revenue was 8.3%, in line with the 8.4% in the third quarter of 2017. Revenues within the nuclear services business were adversely affected by market pressures within the nuclear industry to reduce costs through deferral of discretionary spending coupled with the Company’s increased efficiencies, resulting in shorter outages. Because of the lower margins associated with nuclear services, the impact on Adjusted EBITDA in the third quarter was modest and, for full year 2018, is expected to be offset by positive variances in other businesses. The Company expects the industry shift toward shorter nuclear outages to continue. General and administrative expense increased $12.7 million in the third quarter to $32.6 million from $19.9 million in the year-ago period. The increase was primarily attributable to a $20 million reserve associated with pending litigation, which does not reflect any insurance recovery, partially offset by a reduction in non-recurring startup and other costs recorded in 2017. The Company recently received an offer by APTIM to settle outstanding litigation, and is reviewing that proposal along with its insurance carrier. The Company believes the $20 million reserve is sufficient to address the APTIM matter and all other outstanding legal claims. Operating income (loss) decreased $9.1 million in the third quarter to $(5.9) million from $3.2 million in the third quarter a year ago. The decrease was attributable to higher general and administrative expense, partially offset by higher gross profit. Interest expense increased $15.5 million in the third quarter to $17.0 million from $1.5 million in the third quarter a year ago. Approximately $12.5 million of the increase was attributable to a non-recurring loss on extinguishment of debt in conjunction with the Company’s term loan refinancing, consisting of a prepayment penalty of $2.1 million and the non-cash amortization of $10.4 million of deferred financing costs. 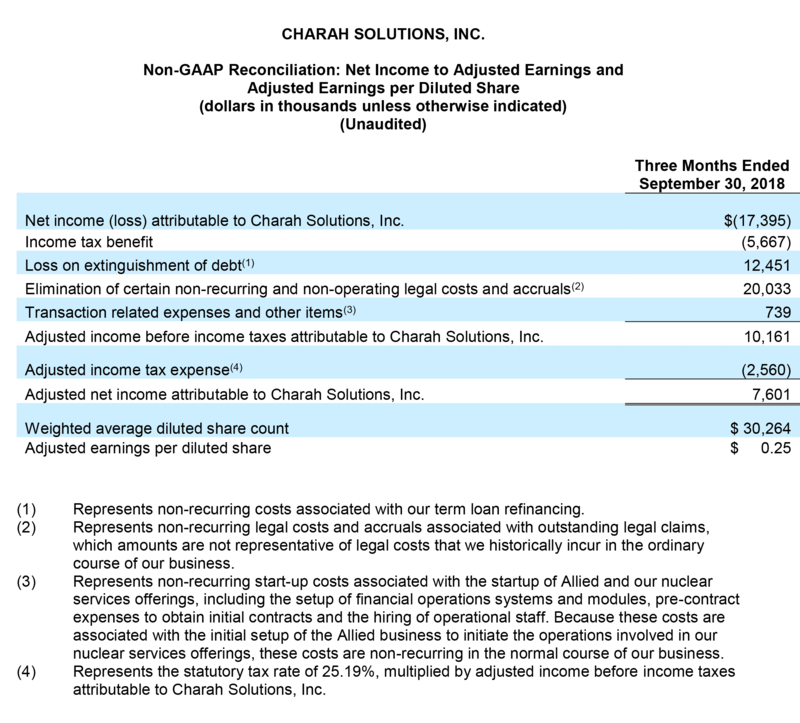 Net income (loss) attributable to Charah Solutions for the three months ended September 30, 2018, was $(17.4) million, a decrease of $18.5 million from $1.1 million for the three months ended September 30, 2017. The decrease was primarily attributable to the decrease in operating income and increased interest expense. Adjusted Net income attributable to the Company, which excludes $12.5 million of non-recurring interest expense and $20.8 million of non-recurring and non-operating legal costs and accruals and transaction costs, was $7.6 million for the three months ended September 30, 2018. On the same basis, Adjusted earnings per diluted share for the three months ended September 30, 2018 was $0.25. Adjusted EBITDA for the third quarter of 2018 was $32.6 million, an increase of $11.9 million or 57% from the year-ago period of $20.7 million. Adjusted EBITDA margin was 17.5%, in line with the 17.4% in the third quarter of 2017. Charah Solutions continues to invest in technologies to help serve customers’ evolving needs and achieved several milestones during the third quarter of 2018. Outside Albany, New York, the Company is near completion of its first facility using proprietary new technologies for grinding granulated blast furnace slag from the steel industry as well as natural pozzolans to create supplementary cementitious materials (SCMs) for sale to concrete product manufacturers throughout the Northeast. The Company expects to expand its use of this technology by investing in several additional facilities throughout the United States where fly ash is not readily available. The Company recently installed its MP618TM thermal fly ash beneficiation technology at its terminal in Sulphur, Louisiana. This technology increases the level of high-quality Class F fly ash that Charah Solutions can provide to meet a number of construction projects in the Greater Lake Charles and Sulphur region. The Company also installed new fly ash storage silos at the Oklahoma Construction Materials rail terminal near Oklahoma City to further expand its MultiSource™ materials distribution network of more than 30 nationwide sourcing locations. In September 2018, the Company refinanced its term loan and revolving credit facility, which is expected to reduce interest expense by approximately $8 million in 2019. The refinancing also resulted in enhanced financial flexibility and a modest increase in the Company’s liquidity. As a result of a change in North Carolina law, Duke Energy recently determined that it would discontinue deliveries of ash to the Company’s Brickhaven site once the Riverbend closure-by-removal project is completed, which is expected to occur in December 2018. As a result of this decision, Charah Solutions accelerated revenues and expenses related to this contract in the third quarter of 2018, which had a net positive impact on both gross profit and Adjusted EBITDA. At this time, in accordance with the contract, the Company expects to receive payment in the first half of fiscal year 2019 for unrecovered project development costs and expected site closure costs. Upon receipt, a portion of the proceeds will be used for debt reduction. In the fourth quarter of 2018, the Company expects to recognize additional accelerated revenues and expenses related to the expected early completion of the Brickhaven contract. The net impact is expected to be positive for EBITDA. The Company expects revenues from its nuclear services business to continue to be affected by the industry pressures previously described, although the impact on EBITDA is expected to be minimal and offset in other areas. In view of these factors affecting the fourth quarter, the Company is providing guidance for the full year 2018 of revenues in the range of $720 million to $730 million, Net income (loss) attributable to Charah Solutions in the range of $(5) million to $2 million and Adjusted EBITDA in the range of $98 million to $105 million. 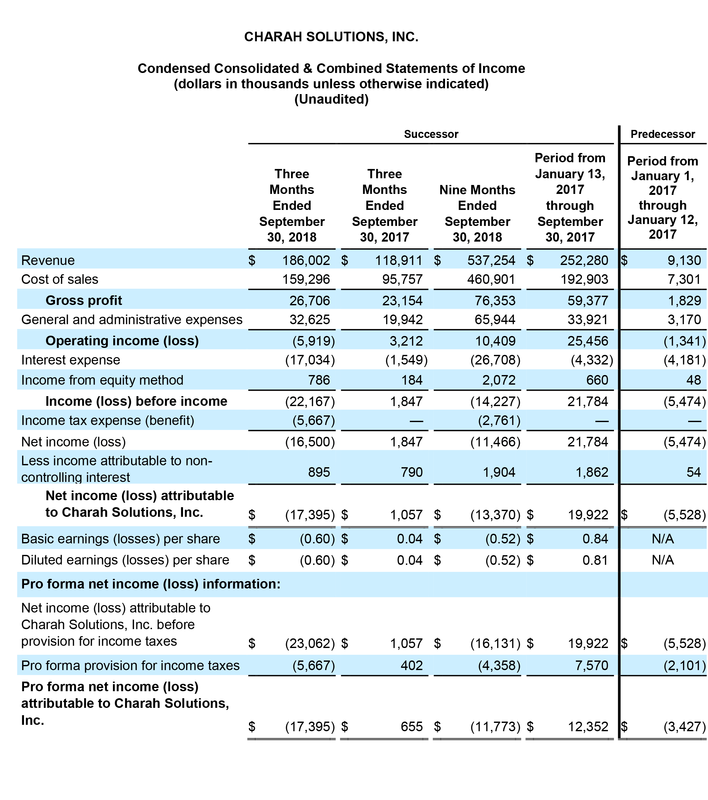 The Company has not provided a reconciliation of its Net income (loss) guidance for 2018 to its Adjusted EBITDA guidance for 2018 because of the difficulty of making accurate forecasts and projections without unreasonable efforts with respect to certain components of Net income that are typically not included in Adjusted EBITDA. Charah Solutions will host a conference call at 8:30 a.m. ET today to discuss the third quarter results. Information contained within this press release will be referenced and should be considered in conjunction with the call. A webcast replay will be available on the Investor Relations section of the Charah Solutions website at ir.charah.com after 11:30 a.m. ET on Tuesday, November 13, 2018. In addition, an audio replay will be available for one week following the call and will be accessible by dialing (800) 585-8367 within the United States or (416) 621-4642 outside the United States. The replay ID is 3296197. A supplementary presentation will also be available on the Investor Relations section of the Charah Solutions website at ir.charah.com. With 30 years of experience, Charah Solutions, Inc. is a leading provider of environmental and maintenance services to the power generation industry, with operations in coal-fired and nuclear power generation sites across the country. Based in Louisville, Kentucky, Charah assists utilities with all aspects of managing and recycling ash byproducts generated from the combustion of coal in the production of electricity as well as routine power plant maintenance and outage services for coal and nuclear energy providers. The Company also designs and implements solutions for ash pond management and closure, landfill construction, fly ash and slag sales, and structural fill projects. Charah is the partner of choice for solving customers’ most complex environmental challenges, and as an industry leader in quality, safety, and compliance, the Company is committed to reducing greenhouse gas emissions for a cleaner energy future. For more information, please visit www.charah.com. This press release contains forward-looking statements within the meaning of Section 27A of the Securities Act of 1933 and Section 21E of the Securities Exchange Act of 1934. All statements, other than statements of historical facts, included in this press release that address activities, events or developments that the Company expects, believes or anticipates will or may occur in the future are forward-looking statements. These forward-looking statements are identified by their use of terms and phrases such as “may,” “expect,” “estimate,” “project,” “plan,” “believe,” “intend,” “achievable,” “anticipate,” “will,” “continue,” “potential,” “should,” “could,” and similar terms and phrases. Without limiting the generality of the foregoing, forward-looking statements contained in this press release specifically include the expectations of plans, strategies, and objectives and the anticipated financial and operating results of the Company. These statements are based on certain assumptions made by the Company based on management’s experience and perception of historical trends, current conditions, anticipated future developments and other factors believed to be appropriate. Such statements are subject to a number of assumptions, risks and uncertainties, many of which are beyond the control of the Company, which may cause actual results to differ materially from those implied or expressed by the forward-looking statements. These include the timing of planned capital expenditures, availability of acquisitions, economic and competitive conditions, the condition of the capital markets generally, as well as the Company’s ability to access them and uncertainties regarding environmental regulations or litigation and other legal or regulatory developments affecting the Company’s business and other important factors that could cause actual results to differ materially from those projected as described in the Company’s reports filed with the Securities and Exchange Commission. Adjusted Net income (loss) and Adjusted earnings per diluted share are not financial measures determined in accordance with GAAP. Charah defines Adjusted Net income (loss) as Net income (loss) attributable to Charah Solutions plus, on a post-tax basis, certain legacy expenses, amounts from a non-acquired business line, write-off of debt issuance costs, prepayment penalties, non-recurring legal and start-up costs, transaction-related expenses and other items. Adjusted earnings per diluted share is based on Adjusted Net income (loss). Adjusted EBITDA and Adjusted EBITDA margin are not financial measures determined in accordance with GAAP. Charah defines Adjusted EBITDA as net income before interest expense, income taxes, depreciation and amortization, equity-based compensation, elimination of certain legacy expenses, amounts from a non-acquired business line, non-recurring legal and start-up costs, transaction-related expenses and other items. Adjusted EBITDA margin represents the ratio of Adjusted EBITDA to total revenues. Management believes Adjusted EBITDA and Adjusted EBITDA margin are useful performance measures because they allow for an effective evaluation of our operating performance when compared to our peers, without regard to our financing methods or capital structure. Management excludes the items listed above from net income in arriving at Adjusted EBITDA because these amounts are either non-recurring or can vary substantially within Charah’s industry depending upon accounting methods and book values of assets, capital structures and the method by which the assets were acquired. Adjusted EBITDA should not be considered as an alternative to, or more meaningful than, net income determined in accordance with GAAP. Certain items excluded from Adjusted EBITDA are significant components in understanding and assessing a company’s financial performance, such as a company’s cost of capital and tax structure, as well as the historic costs of depreciable assets, none of which are reflected in Adjusted EBITDA. Charah’s presentation of Adjusted EBITDA should not be construed as an indication that the Company’s results will be unaffected by the items excluded from Adjusted EBITDA. Charah’s computations of Adjusted EBITDA may not be identical to other similarly titled measures of other companies. Charah uses Adjusted EBITDA margin to measure the success for the Company’s business in managing its cost base and improving profitability. 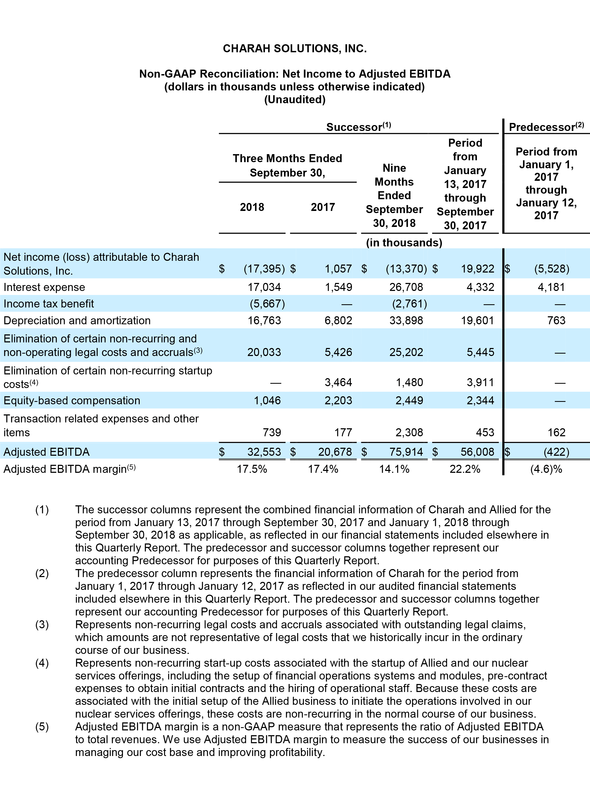 A reconciliation between Adjusted EBITDA to net income, Charah’s most directly comparable financial measure calculated and presented in accordance with GAAP, along with the Company’s Adjusted EBITDA margin is included in the supplemental financial data attached to this press release.